Renee Gaddis, NCIDQ, ASID, GREEN AP, President and Principal Designer at Renee Gaddis Interiors has completed the preliminary design for the interior of the Duval model at The Ronto Group’s Eleven Eleven Central community, a new walkable/bikeable, access-controlled community to be built by the award-winning developer on Central Avenue between10th Street and Goodlette-Frank Road in downtown Naples. Four models, one of which is under contract, will be included in the community’s Phase I building and showcase Ronto’s Duval, Collins, and Belair floor plans. Ronto anticipates beginning construction by the end of this year. Phase I features 62 residences showcasing five two-bedroom, two-bedroom plus den, and three-bedroom open-concept floor plans ranging from 1,407 to 2,297square feet of living space, including covered outdoor balconies. Two floor plans, the Atlantic and the Avalon, are sold out. Pre-construction pricing on the remaining unsold residences starts at $725,000. Base-priced at $1,055,000, the three-bedroom, three and-a-half bath Duval floor plan features 2,297 square feet with 2,045 square feet under air. The living area features a great room, dining area, and an island kitchen wrapped by perimeter cabinetry and counter surfaces. The great room, dining area, and one of the guest bedrooms open to the L-shaped covered balcony. Gaddis has created a shabby-chic interior for the Duval model that will provide a comfortable living space for people of all ages. Her color palette features neutral tone on-tone griege backgrounds with flashes of grey in the living areas and touches of blue in the master suite. Light, sandy-toned wood flooring, the kitchen island’s light reclaimed wood base, darker cabinetry on the kitchen’s perimeter, and wood furniture pieces will provide notes of contrast. Architectural details and ceiling treatments will be evident throughout the model. 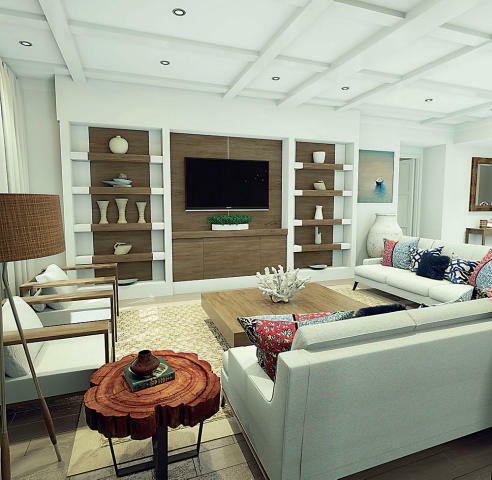 The feature wall in the great room will showcase a clean-lined furniture piece with a striking wooden front and white surround that will be flanked by floor-to-ceiling built-in cabinets with open upper shelving and closed lower storage. A television will be wall-mounted between the cabinets. A deep sectional sofa in a neutral-toned fabric will provide seating for eight as well as a place to stretch out. A carved wood side chair also with neutral-toned upholstery will be paired with an ottoman to provide an additional place to relax. The seating will be anchored by a grey-toned washed-wood solid plank coffee table set atop a neutral woven rug layered over a sisal area rug. The great room’s windows will be finished with stationary side panels in an embroidered neutral fabric. In the adjacent dining area, a solid reclaimed whitewashed wood dining table with an x-base will be surrounded by eight neutral slip covered dining chairs with washable seat cushions. The chairs will have four wooden legs with a light finish. 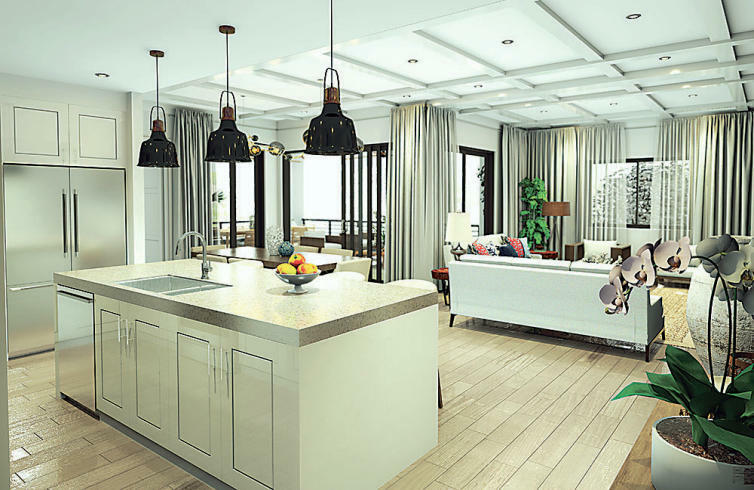 Like the great room, an architecturally designed ceiling detail is planned for the dining room along with a black and polished chrome lighting fixture. The kitchen island’s light-toned wood base and the darker toned perimeter cabinetry will play against light quartz countertops. As planned, the quartz finish will also run up the perimeter walls to provide an attractive backsplash. The barstools at the island will be presented with a two-toned neutral and grey rope back, neutral upholstered seats, and a washed wood base. Pendant lighting over the island will include glass with polished chrome accents. A vestibule will provide an attractive point of entry to the owner’s suite where the wood-tone flooring will continue. Spacious walk-in closets will flank a hallway leading to the owner’s bedroom. The bedroom will be presented in neutral tones with pops of ocean blue. Gaddis has chosen a bed with a tufted neutral-toned fully-upholstered headboard, side rails, and foot board to serve as the center piece for the room. Whitewashed wooden nightstands with a pale blue ocean color tone will offer a bit of rustic flair. 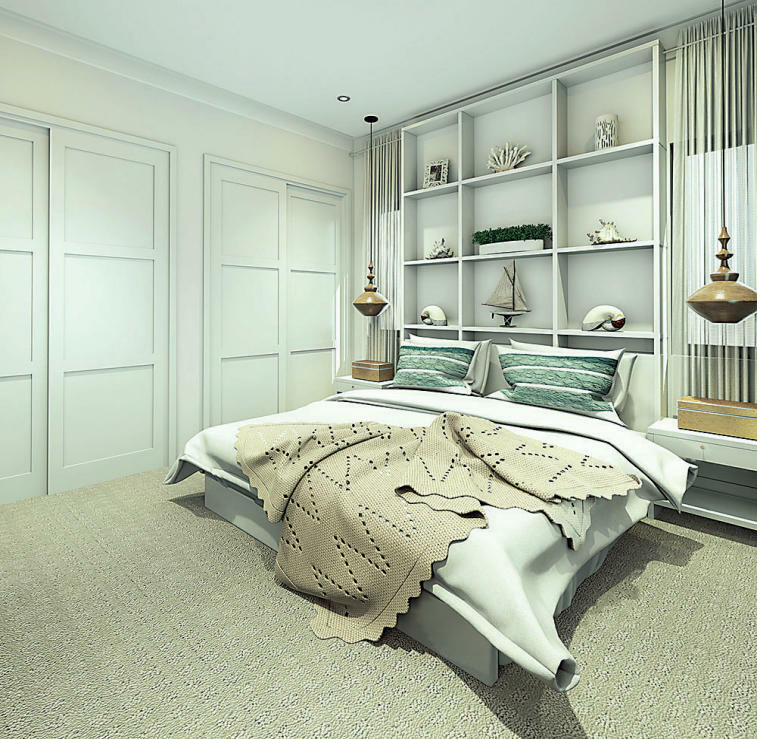 The bed’s pillows will continue the blue influence as well as the draperies that will include white and blue stripes. A whitewashed reclaimed wood furniture piece with a wall mounted television above will serve as a dresser. An accent chair will be finished in a neutral-toned slip cover with a stitched detail across the bottom. The flooring in the owner’s bath will be a neutral toned tile that will play against an ocean blue wall covering. The double vanity cabinetry will be presented in light toned wood topped by a quartz countertop with under mount sinks. The neutral tile will carry into the shower and be accented by a blue mosaic. As planned, the owner’s bath will also include a free-standing soaking tub. 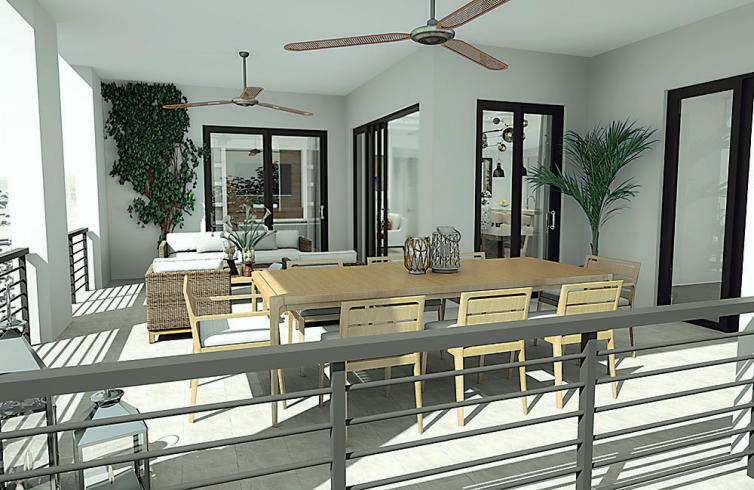 Gaddis will furnish the model’s balcony with a solid wood outdoor dining table with an x-base and four dining chairs done in grey rope. Four lounge chairs and a coffee-colored ottoman will offer a place to relax. Themodel’s L-shaped covered outdoor balcony will overlook Eleven Eleven Central’s courtyard amenity deck that will feature a 3,500 square feet resort-style pool with a beach entry and two 90-foot lap lanes, chaise lounges and poolside tables, two spas, outdoor showers, poolside cabanas, grills, a cabana bar with large screen televisions, fire pits with built-in seating areas, a hammock lawn, an outdoor chess set, a yoga stretching area, and two bocce ball courts. Two downtown Naples sales centers represent Eleven Eleven Central and Ronto’s Naples Square community, one located at 100 Goodlette-Frank Road South, the other in unit 101 of the Naples Square Phase I building at 1030 3rdAvenue South. Both sales centers are open daily. Visit1111Central.com or NaplesSquare.com. 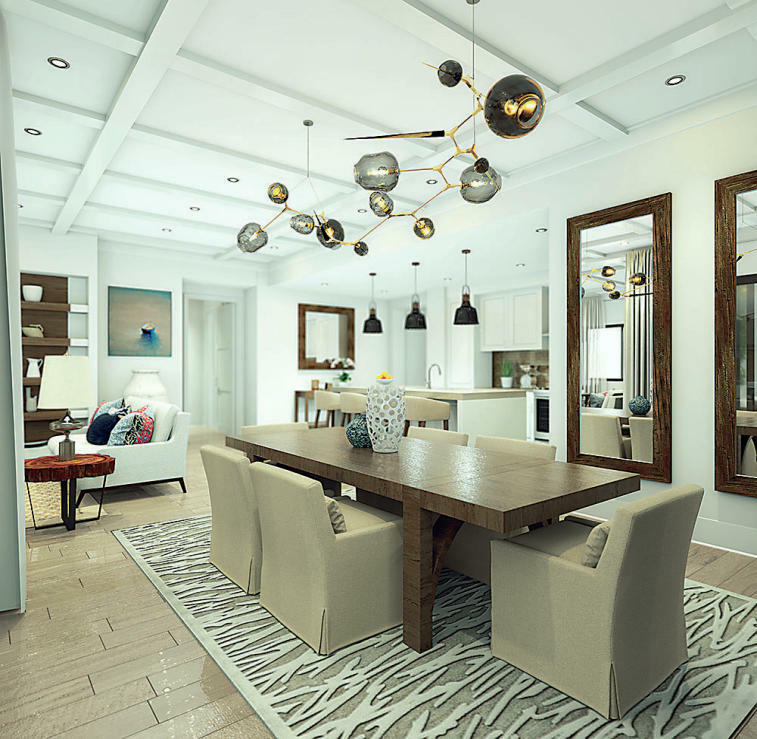 In the Duval model’s dining area, a solid reclaimed whitewashed wood dining table with an x-base will be surrounded by neutral slip covered dining chairs with washable seat cushions. A vestibule will provide an attractive point of entry to the Duval model’s owner’s suite where the wood-tone flooring will continue. Spacious walk-in closets will flank a hallway leading to the owner’s bedroom. The Ronto Group announced The Ronto Group announced Renee Gaddis Interiors has completed the preliminary design for the interior of the furnished Duval model at Eleven Eleven Central. This rendering is an artist’s conception of the Duval great room. The Duval model’s kitchen island’s light-toned wood base and darker toned perimeter cabinetry will play against light quartz countertops. As planned, the quartz finish will also run up the perimeter walls to provide an attractive backsplash. The balcony at The Ronto Group’s Duval model at Eleven Eleven Central will be finished with a solid wood outdoor dining table with an x-base and four dining chairs done in grey rope. Four lounge chairs and a coffee-colored ottoman will offer a place to relax.